BOMBERG, the young watch brand from Switzerland produces spectacular timepieces specially designed for discerning male. This mid price range timepieces stands out with their muscular design, sleek industrial lines and the manly attitude. Made its debut in 2013, the BOMBERG introduced three models – 1968, Maven and Semper – the superior timepieces made for those men who live a red blooded life and possess an uncompromising sense of style. The BOMBERG 1968 collection consists of 22 timepieces featuring cutting edge, slick black look with smooth, burnished lines and a striking asymmetric watch case and available with both chronograph and automatic movements. The chronograph models equipped with highly reliable Miyota OS11 movement, offer high functionality and ruggedness of a sports timepiece. The unconventional positioning of crown and pushers adjacent to the lugs is very interesting, also easy to handle. The 44 mm, round, sandblasted PVD case along with black leather strap and sand blasted PVD buckle displays the bold character of the timepiece. The black sandblasted case back is screwed down thus ensuring the exceptional water resistance of 100 meters. These models are available in various dial colour versions such as black, green and orange. Indexes, counter and hands are applied with Luminova to increase the legibility of the timepiece. In the functional side, this BOMBERG 1968 model features a Tachymeter scale, chronograph counters and day and date indication. 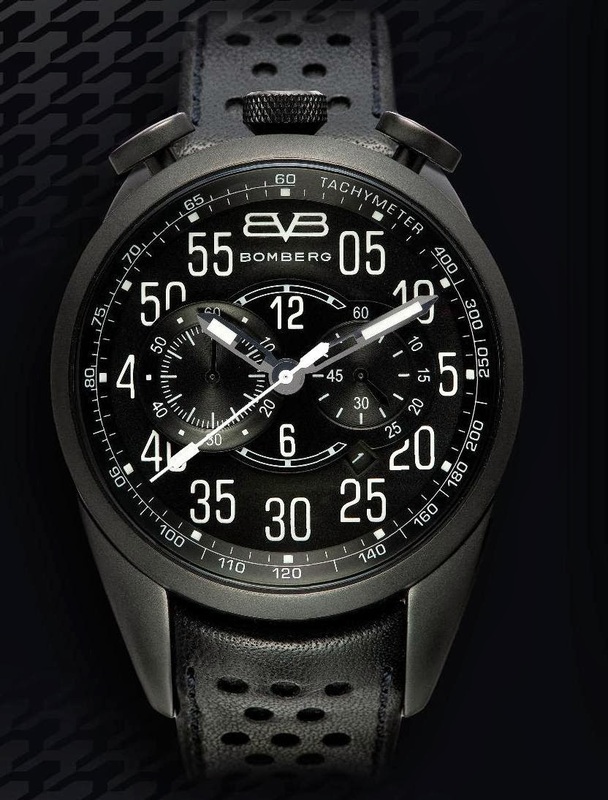 Inspired by its initial success, BOMBERG is gradually conquering the markets worldwide. Now the brand has launched a special campaign only for the customers from USA and Canada by offering the models from their flagship collection 1968. The chronograph models, priced $675, can be purchased online by visiting the BOMBERG online boutique. The BOMBERG 1968 collection also offers automatic models. BOMBERG is a new comer to Switzerland’s tradition rich watchmaking industry. Headquartered at Neuchâtel, the nerve centre of Swiss horology industry, this revolutionary watch brand offers exceptional timepieces in mid price range without compromising on quality and trustworthiness. Three exceptional collections – 1968, Maven and Semper – with their resolutely male attitude enrich BOMBERG’s inventory. Each timepiece comes with BOMBERG’s uniquely exceptional customer service, and a two year warranty. BOMBERG‘s ambassadors are Austin Trout (WBA Junior Middleweight Champion of the World), Martin Fuentes (Mexican racing drive) and Chris ‘The Birdman’ Andersen (superstar basketball player for NBA champions Miami Heat).